Monsanto's cash cow weedkiller Roundup probably causes cancer, according to a new report from the United Nation's cancer research organization. The International Agency for Research on Cancer (IARC), published a report in the journal Lancet Oncology on Friday with findings on three pesticides, including Monsanto's best-selling brand. The report found that the herbicide glyphosate — the active chemical ingredient in Roundup — and two insecticides, malathion and diazinon, were "probably carcinogenic." The conclusion was based on "limited evidence" of cancer among humans. Researchers also found "convincing evidence" among animals for classifying the insecticides tetrachlorvinphos and parathion as "possibly carcinogenic." These mature trees were planted on the public parkways starting in the 1920s and reach as high as 100 feet. They are an irreplaceable resource valued for the unique beauty they give to the street and for the protection they give from blazing summer temperatures. Additionally, their uniform height and size has not only attracted a number of film companies, but has increased the value of the homes on the street. Right now, these trees are threatened by rampant development. In the past few years, five of these healthy approx. 90 year old trees have already been destroyed by builders who do not value their importance as a neighborhood amenity. California Clean Money Campaign recently created a petition on our public petition website entitled "Help small donors, not big donors!
. . . huge amounts of public funds would be given to the largest donors. Please amend the proposal so that matching funds benefit small donors, not big donors! Stop dark money non-profits from hiding their funders! Know who is funding these non profit organizations who try to pursue Californians votes. SB 27 (Correa) will make sure billionaires and corporations can't hide behind secretive non-profits. I guess LA City Council is not receiving adequate pay and needs, in addition, to receive gifts from contractors - is this ethical? This is sounding more like how Congress operates. Big Oil has plans to massively expand fracking in a huge section of the state--roughly 1,750 square miles from Southern to Central California, from Modesto to San Diego County--putting our precious water, our farms, and our health at risk. Tell Google to quit ALEC now! A Utah slaughterhouse was caught painfully pushing a cow with a forklift. But when the police showed up, they weren't there to shut things down. They were there to press charges against Amy Meyer -- the citizen filming the cruelty -- even though she never left public land. ". . . and even place whistleblowers on a "terrorism registry." Warning, the video below is graphic and disturbing, use discretion. Congress now faces a stark choice on the NSA and civil liberties. 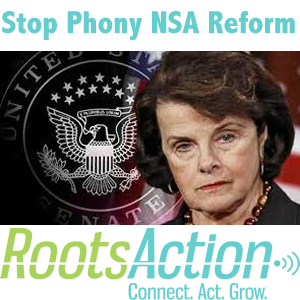 A bill sponsored by Senator Dianne Feinstein -- the FISA Improvements Act -- would make matters worse. As ACLU legislative counsel Michelle Richardson puts it, the Feinstein bill "would entrench the current spying programs" of the NSA. "For the first time in history, Congress would explicitly and intentionally authorize dragnet domestic spying programs targeting every day Americans." Stop Clearcutting in California's Forests! Large timber companies clearcut over 60,000 acres of California's forests each year, leaving environmental devastation in their wake.